I was a teenager in the 90s and that meant that I was assaulted music videos and all the other that MTV used to play. I have always lived for film, but the music video was a close second. I loved music videos. It didn't matter what the genre of music it was, put a music video in front of me and I was a happy camper. This all brings us to the trailer for today. 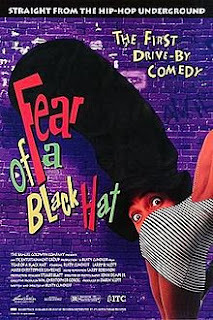 Fear of a Black Hat was one of two films, to come out around the same time, that focused on spoof the rap scene. CB4 with Chris Rock was a big studio production, but was not nearly as funny as Fear of a Black Hat. Fear takes the form of a mockumentary that mimics This is Spinal Tap in structure as well as a few jokes here and there. While people call Spinal Tap one of the funniest films of all time, give me Fear of a Black Hat over it any day of the week. Not only does Fear spoof the rap scene, but it also spoofs the music scene in general. Even the jokes that poke fun at the LA riots are funny because they poke fun at the stupid, timeless things about the riots. Fear also would ring true today in terms of its look at race and racism. There is a scene where the main character is pulled over by the police that would play out like a suspense scene today. Give the trailer a watch, then go watch the film.